The R 922 crawler excavator, winner of the iF Design Award 2019 in the "product design" category. 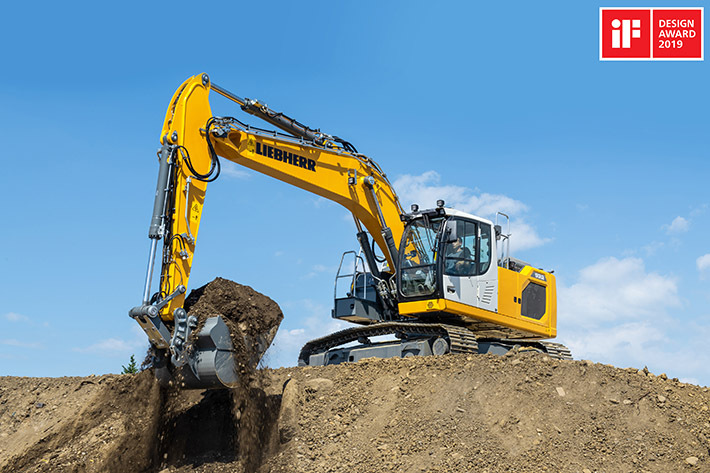 Like all the crawler excavator models in Liebherr's latest generation 8, the R 922 benefits from a fully redesigned architecture offering users enhanced comfort, safety, ergonomics and operating performance. Accompanied by other representatives from the brand-new generation 8, the R 922 will make its world début on the Liebherr stand at the Bauma 2019 fair in Munich from 8 to 14 April. Founded 65 years ago, the annual iF product design award recognises the best in product design around the world. Every year, 5500 entries are received from 59 countries. A benchmark for consumers and users alike, there are various categories in the iF product design award: Product, Packaging, Communication, Interior Architecture, Professional Concept, Service Design/UX and Architecture.